Source: Weekend, April 29, 1972. As the frigid winter of 2015 gives way to spring, the thoughts of some Torontonians turn to long drives. With ice and snow seasonally removed from the list of road hazards, cyclists and drivers can imagine long, relaxing days of exploration outside the city (treks in heavy weekend traffic to cottage country not included). At various times over the past half-century, the Ontario government supported special touring routes designed to provide glimpses of the province’s natural beauty and rich history. One of the first, the Heritage Highways, wound its way through our fair city. And for years, drivers passed the small brown signs marked with a pioneer’s wagon wheel. Eaton’s did its part to support provincial tourism during the 1970s. Source: Toronto Star, June 25, 1977. 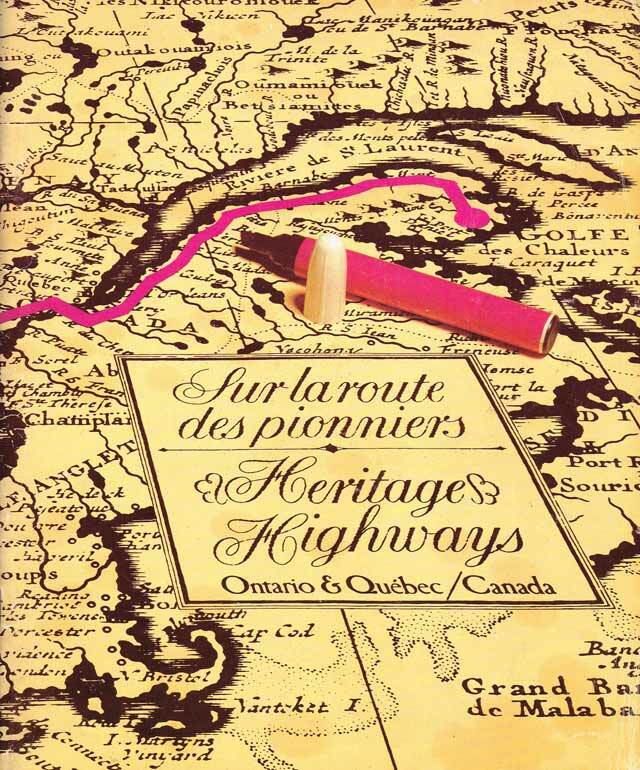 The first Heritage Highways guide was a joint project of Ontario and Quebec’s tourism ministries, designed to tie into Expo 67. 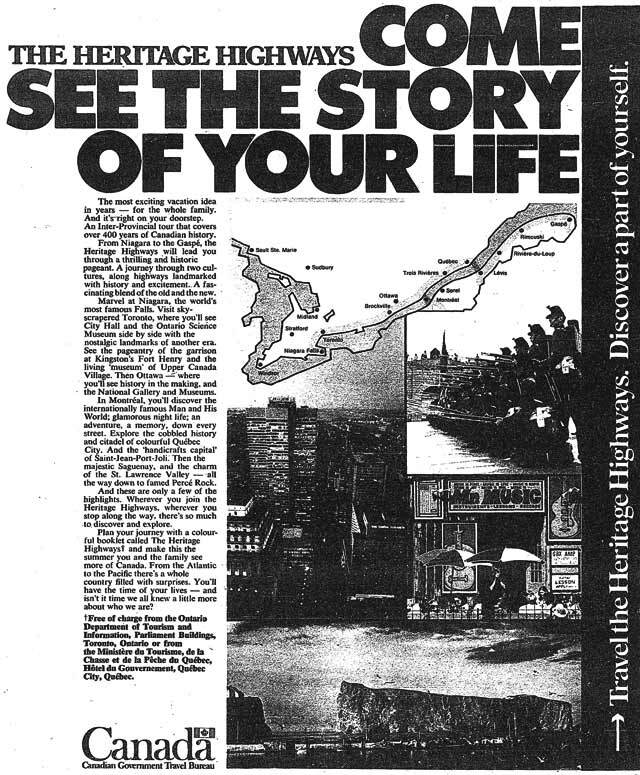 Among their goals was to encourage travel between the two provinces: as the 1978 edition of the guide put it, “provincial boundaries mean little to the traveller intent on gaining the maximum pleasure from his vacation itinerary” (roadtripping apparently being a gender-defined concept to 1970s tourism copywriters). Around 500,000 copies were printed for distribution in both provinces, along with some venues in Manitoba and Michigan. The original route ran from Niagara Falls to the Gaspé, mostly along Highway 2, and was later extended west to Windsor. In Toronto, much of the route was located along Lake Shore Boulevard and Kingston Road. The route even inspired a series of five-minute television programs in the early 1970s, which highlighted attractions along the way. Cover of the 1978 edition of the Heritage Highways guide. Toronto, the Capital City of Ontario, is a safe, clean, friendly metropolis which has emerged as one of the most dynamic cities on the continent. The downtown core of the city is dominated by the City Hall and Civic Square, an overwhelming piece of civic architecture designed by the Finnish genius Viljo Revell, with arc-shaped twin towers, a domed amphitheatre and pedestrian walkways that form a spacious setting for Henry Moore’s monumental sculpture, “The Archer.” Narrow, bustling Bay Street contains the busiest stock exchange on the continent outside of New York. Stately University Avenue, with its mall of flowers and fountains, leads to Queen’s Park, the setting of the historic Ontario Legislative Buildings and the immense campus of the University of Toronto. The Royal Ontario Museum contains one of the world’s finest Far Eastern collections and, next door, the McLaughlin Planetarium depicts the stars in their courses and tells the story of the infinite universe. Bloor Street contains the most fashionable of shops, malls, mews and promenades, while nearby Yorkville Avenue abounds in “way out” boutiques, coffeehouses, restaurants, small private galleries, and sophisticated couturiers. Housed in a building which complements its ravine setting is the Ontario Science Centre, the happiest combination of instruction and entertainment ever! “Please touch—explore—find out” is the theme of the Centre, a new-concept centre where the visitor gets involved with more than 550 exhibits, most of them workable by the visitor, in an environment of fun and discovery. During the summer, Toronto’s multicultural groups organize festivals like Metro International Caravan and Caribana…and there’s the swinging Mariposa Festival of folk, blues and country music. The winter season open with the Royal Agricultural Winter Fair that includes a heart-stopping international horse show…while the Toronto Maple Leafs are playing the world’s fastest hockey at Maple Leaf Gardens. For an exciting view of the city take an elevator ride to the top of the CN Tower. Over a third of a mile high, it is the tallest self-supporting structure in the world. Though the downloading of provincial highways to municipalities during the Mike Harris era made hash out of Ontario’s official tourist driving routes, signs are still seen in some areas. 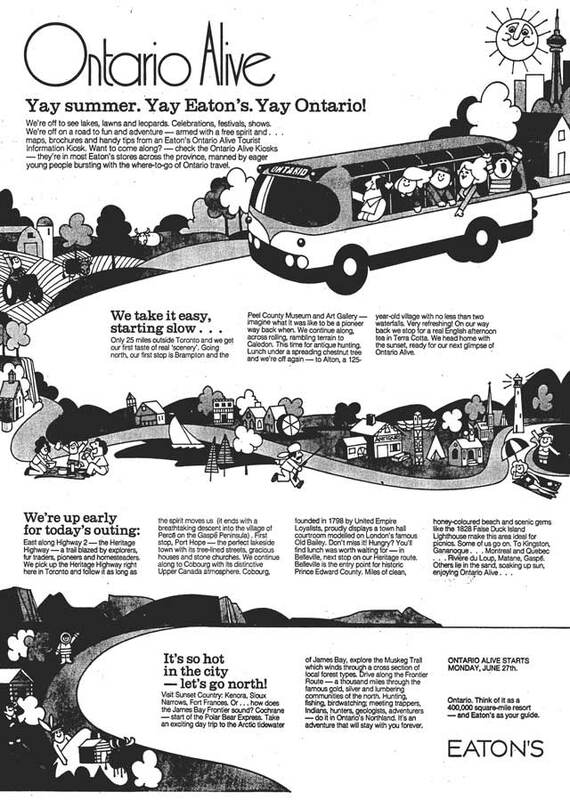 Additional material from Heritage Highways (Toronto: Government of Ontario, 1978); the April 19, 1967 edition of the Globe and Mail; and the April 16, 1972 edition of the Toronto Star.